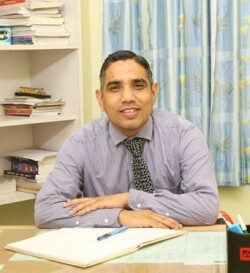 Mr. Kuldeep Jakhmola has been working as a Dean of Mathematics looking after classes XI & XII and Senior Mathematics teacher in the Aryan family from the last 12 years having 17 years experience behind him. He strongly believes in the philosophy that the best way to make children smart, to face the challenges of today, is to keep them happy. He feels that the qualities like sincerity, honesty, diligence, courage, patriotism, co-operation, to be humble in victory brave in defeat are important to face the competition the children face today. Then only the children can grow socially, physically, and intellectually. He is also in charge of the General Knowledge Quizzes which are held on and off. He believes that in the Aryan School we don’t write history but we are trying hard to create history in every field be in academics, debate, drama, quiz, sports and social service etc. All this is reflected in all the Aryans under the guidance of our respected Principal Ma’am who is like my mother both in personal & professional life.